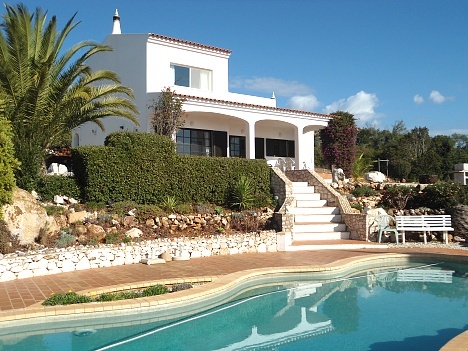 Large, comfortable villa with private pool and wonderful panoramic views to the coast. 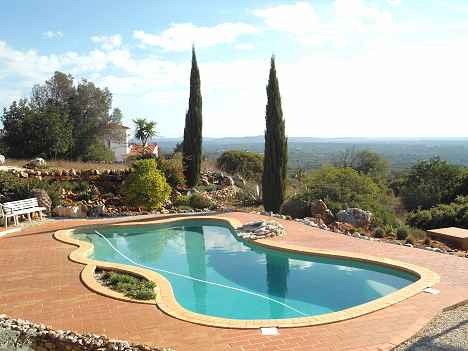 Sitting in beautiful unspoilt countryside, with crops of citrus fruits, avocado, mangoes and olives, the area is peaceful and secluded, but not isolated with other villas within close walking distance. The villa is set in the middle of land, on a hillside, with uninterrupted views to the coastline stretching from Portimao to Albufeira. This is the perfect place for a wonderful holiday away from all the crowds, yet within a short driving distance of beaches, water parks and high quality golf courses. 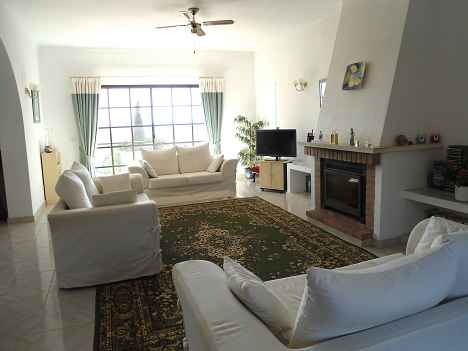 The villa is roomy and cool in summer with ceiling fans in all the rooms and mosquito closings on all windows and doors. Patio doors open from the lounge and dining room onto a large shaded terrace, ideal for ‘al fresco’ dining on freshly cooked food from the static barbeque, or sitting enjoying a good book. The pool is very private and perfect for a cool dip or just relaxing on the loungers drinking in the view. The ground floor comprises of: large lounge with comfortable seating for seven people, TV with English channels, large choice of reading material, music library, CD player, radio; Fully equipped kitchen with washing machine, dish washer, gas hob, oven, grill, refrigerator, freezer, microwave, toaster, kettle, blender, wide range of cutlery, crockery and kitchen utensils, iron, ironing board, hair dryers; Separate Dining area for 6 people. The Master bedroom is up a marble staircase from the hallway and is very spacious. It has a large en-suite bathroom and patio doors leading to a small private terrace, with amazing views across the countryside to the coast. The terrace is ideal as a quiet “get away” space or for a little private sun bathing. The other two bedrooms are on the ground floor, so the two areas are quite private. They face north, so stay cool in the summer. There is a full bathroom and a shower room to cater for the ground floor bedrooms. 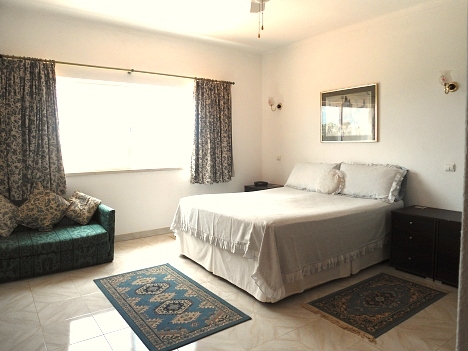 All the bedrooms have fitted wardrobes, ceiling fans and mosquito closings on doors and windows. Hairdryers and safe in downstairs bedroom. Outside is a veranda covered terrace with dining table and seating for six people, plus easy chairs for comfortable relaxing. Static barbeque for cooks to enjoy. Swimming pool Steps down from the house. Loungers for six people, plus chairs and umbrellas and a covered gazebo. A particularly private and secluded area. Situated between Silves and Messines, both are just a short drive away and have plenty of good restaurants, supermarkets and daily markets for local fruit and freshly caught fish. Silves has a long history of importance and a number of interesting sites to visit. Several quality golf courses are a short distance away. There are a number of restaurants dotted around the countryside which make excellent Portuguese meals and give visitors a chance to savour the ‘real’ Portugal at very reasonable prices. The beaches of Armacao de Pera, Carvoeiro and Gale are about twenty minutes drive away, as are the water parks and Zoomarine. 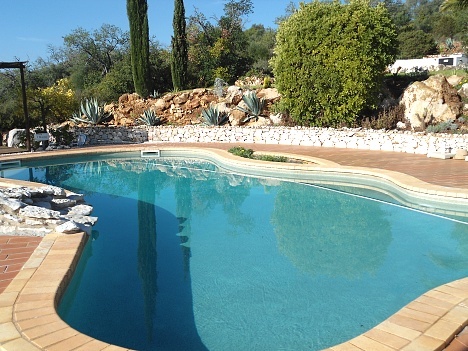 However most people just love to be at the villa enjoying the pool and surroundings. Interesting places such as Monchique, Lagos and Sagres are less than an hour away by car and there are numerous little villages dotted about which are fun to visit. About a forty minute drive from the airport on a good motorway.